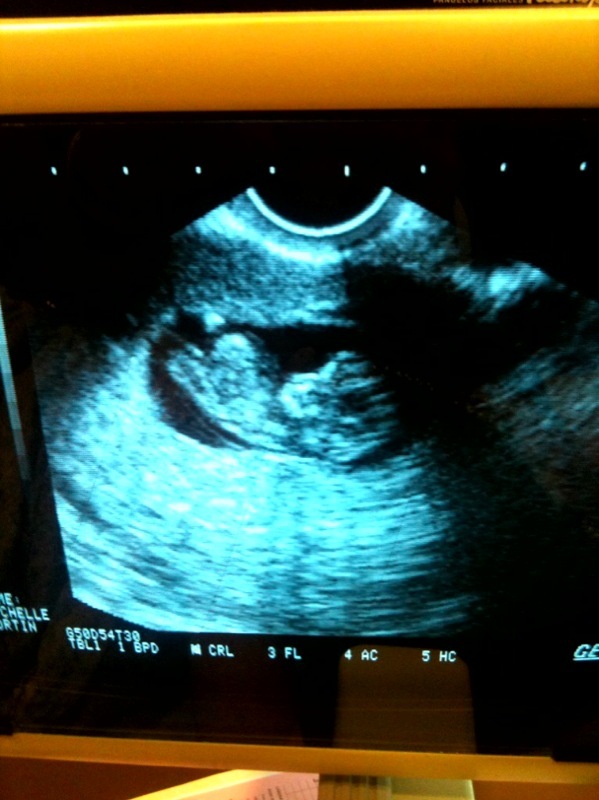 Here are the weekly updates from the Dream pregnancy #1, which resulted in a healthy, gorgeous baby boy on May 31, 2011. You can see his monthly photos here, read his birth story here and see the snazzy professional maternity shots here. 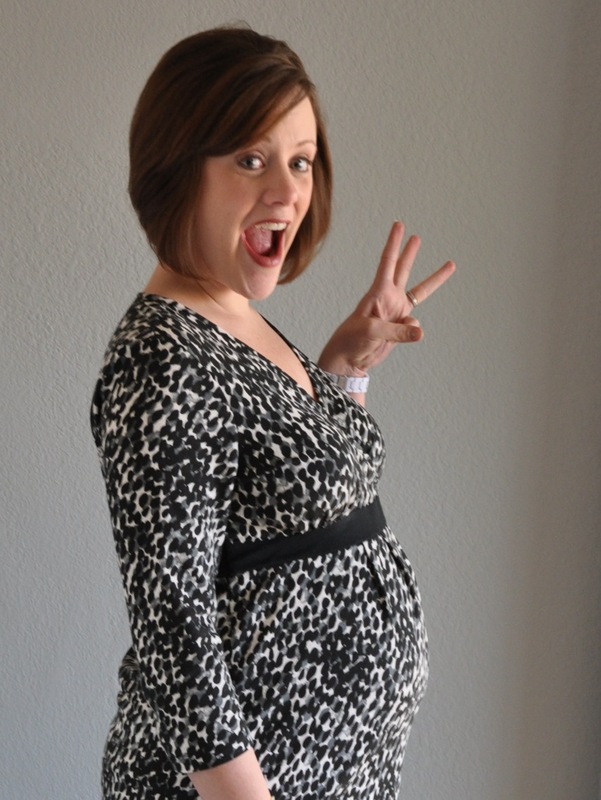 6/7/11 – “42 weeks”: Okay, so this is the final bump pic of the Kenton pregnancy! I’m very glad to share it with a handsome fella. As you can see, I’m ecstatic! Can you blame me? 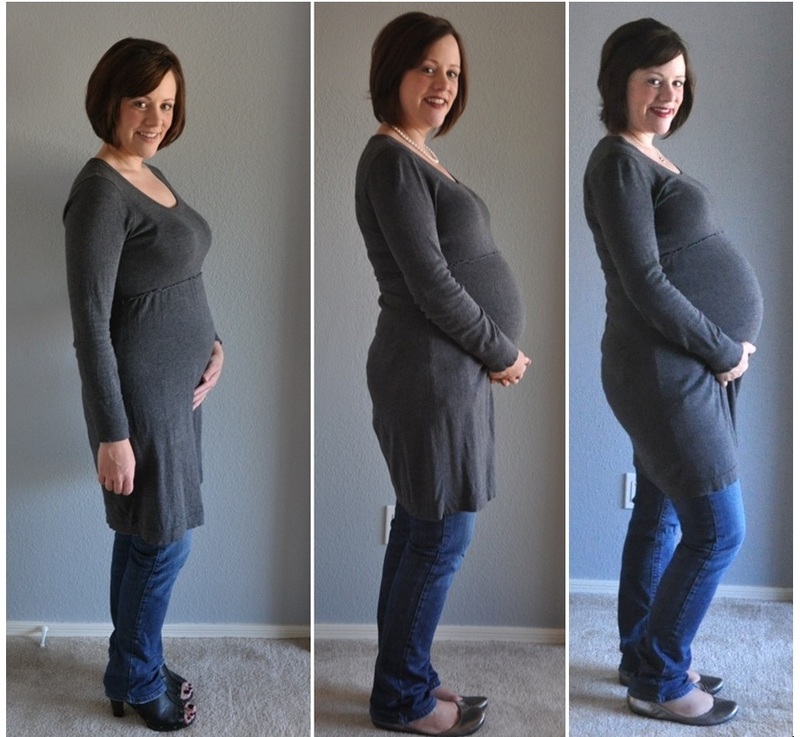 5/23/11 – 40 weeks: The bebe is fully formed. Completely cooked. Lungs developed. Liver is functioning. Basically, he/she is OFFICIALLY a freeloader now… and completely overstaying their welcome. Momma is READY to be unpregnant. Hopefully, this is the final bump picture and by next week, we’ll have a BABY picture to share. That said, I’ll save a possible bump picture next week for full-on whining. (You’ve been warned.) Now, I’ll count my blessings. Despite apparently going past my due date, this has been the most boring pregnancy in history. I never threw up. Heartburn did not rear it’s ugly head (except in the very beginning during workouts – but that was easy to curtail!). My good friend told me I never got “pregnancy face” and I choose to believe her. I don’t even have stretch marks (yet! Baby, GET OUT before those happen!!). The only real issue I’ve had is carpal tunnel – woah nelly is that ANNOYING. I had no idea. (My fingers are asleep as I type this.) Even that is completely manageable – when you know it’s temporary. So, if you think of me this week – please say a little prayer that BOB decides to come out and meet us soon, very SOON! 5/9/11 – 38 weeks. So, the books say that 85% of babies are born within two weeks of their due date… however, this momma-to-be is no dummy and realizes that means two weeks before AND AFTER the due date. So, the baby in the belly could make a grand entrance any time between now and four weeks from now. Of course, we’re hoping he/she is on the early side! But I did tell my OB I’m planning to go a week overdue and have to be induced. I think she considered hugging me – odd because she’s not exactly warm & fuzzy (but we LOVE her!). She said her other patients never think that way and that’s exactly the right mindset. Of course, we’ll all be thrilled if everything happens sooner and without assistance. But… just in case… be prepared for at least three (but hopefully not four!) more bump pics. Do you think I’m carrying a boy or a girl? Did you vote in our poll?! 16 weeks – 26 weeks – 36 weeks! 4/18/11 – 35 weeks. For some reason, this is a major mental milestone week. 35 weeks?! That’s a big deal, right? I’ll probably be saying that every week for five more weeks… you’ve been warned. Fatigue is really starting to hit me. Thankfully, this is the last week where we have a commitment every night – after this, things will slow down a bit – and I’m VERY excited about that. Don’t get me wrong – I’m an extrovert – so being around people is awesome. But I’d rather just be around my baby-daddy, Bulldogs, remote control, and laptop (with easy access to my latest obsession) for now. So, take the hint peeps – stay away. I kid, I kid… Or do I? 4/11/11 – 34 weeks. This was a big week. 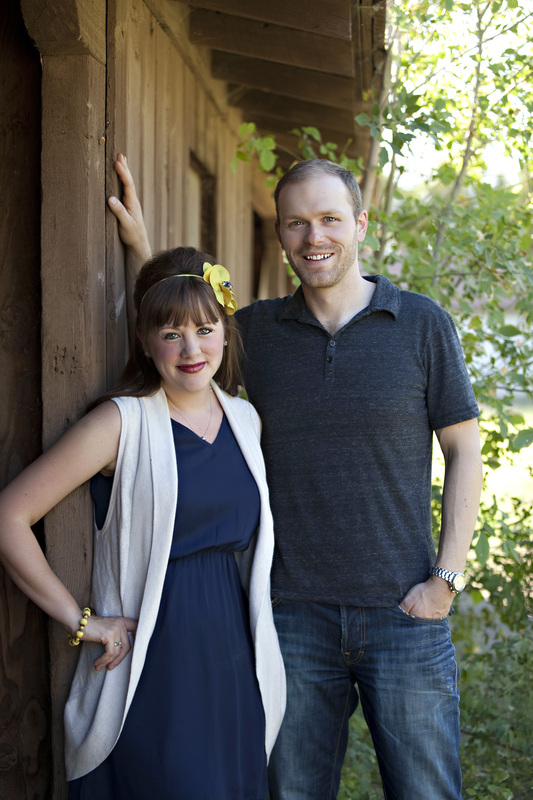 Sure, Mr. Dreamer and I started our birthing class – that was pretty cool. Yeah, so we also found a great chair for the nursery (finally! – post on that coming soon). But by “big” I mean that my belly button is no longer visible. Yep, my daily “is my innie an outie yet?” checks now require the assistance of a mirror. Wasn’t expecting that. I mean, I knew my toes would disappear – and they did, a while ago – but the belly button? Nope, didn’t think that would expand out of view. For the record – it’s really not an innie anymore, but not quite an outie yet. How’s that for information you couldn’t start your week without?! 4/4/11 – 33 weeks. What’s better than a bump pic? Say it with me… A BABY PIC!!! 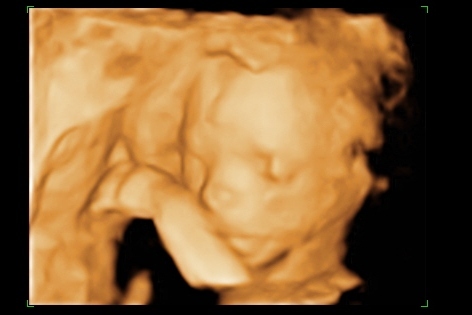 Here’s the wee one at 33 weeks – healthy and BIG, 5lbs 8oz already. Go baby! 1) I’m still in shock over the AMAZING shower from this weekend. 2) We’re in the single-digit countdown now (9 weeks left!!!) 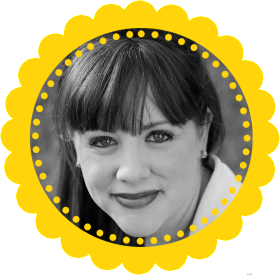 and I just read about another blogger who had her precious little one five weeks early. Please, Lord, no?! I won’t be ready for our sweet little bundle in four weeks. AACK! Isn’t that nice. Mm-hmm… now for reality… what’s hiding under that sweater? That’s more like it. Just 10 weeks to go… WHOOP! 3/7/11 – 29 weeks. That dreaded third trimester fatigue is starting to set in, but I’m fighting it as much as I can! The hormones are also all out of whack right now – meaning I’m a very pleasant person to live or work with. Sorry! I’m trying my best… (note the teeth-clenched smile). Actually, things are much better than last week. I may be getting the hang of this pregnancy thing – but that doesn’t mean I’m not ready to get the bebe out of my belly! I think he/she is ready too – at least it feels like escape attempts are happening on a regular basis. At what point does the baby learn he/she does not come out of my belly button?! 2/28/11 – 28 weeks. (That’s the 7 month mark, folks. Craziness.) Nesting is in full swing around the Dream. And by, “nesting” I mean – buying everything I need for a big nursery project, coming home, spreading it all out, staring at it for a looooong time, eyes welling up – then full-blown tears, convulsing, hyperventilating over the fear I’m starting to go catatonic because IT’S ALL TOO MUCH!!! Or… reminding Mr. Dreamer over and over (and over and over) about the list of things I would accomplish for the nursery, but he won’t let me (paint fumes and such) and how they should get done NOW and I wish I could just do them myself, because I know I’m asking a lot of him – elbow to his ribs. Poor guy! Despite all that… the nursery is actually almost done. And it will be done by our deadline in less than 3 weeks. WHEW! Amidst all of the convulsing, crying and rib-elbowing, the beh-beh managed to drop a bit (not sure you can tell in this photo) and find certain parts of mommy’s insides that don’t feel so good when they’re kicked, tickled, or punched. In other words, I’M JUST FINE THIS WEEK, THANK YOU. Bowdoin the Bulldog gets it. 2/21/11 – 27 weeks. HELLO, THIRD TRIMESTER! I have mixed emotions greeting you – happy because the beh-beh is arriving in three months, but LORD ALMIGHTY, the BABY IS ARRIVING IN 91 DAYS (not that we’re counting… but we are… on the kitchen chalkboard). I am just getting into the rhythm of this “honeymoon” phase of pregnancy, and now the evil third trimester arrives. My skin looks divine, the bump is radiant (and clearly a bump), nothing is swollen yet, wedding rings still fit, energy levels are the best they’ve been so far this pregnancy – and now, THE THIRD TRIMESTER. What in the world are you going to do to me? I’m frightened. The picture is quite deceiving, but I am frightened. Also, all of you so-called “friends” and “loved ones” out there who’ve gone through this pregnancy thing before woefully neglected to tell me about the amount of blood that would spurt forth from my gums every morning and evening. I called the dentist – they laughed – apparently it’s normal. Woe to you, women. I should have been warned – it is not cool. The baby, however, is blissfully unaware of the blood and the FREAKING OUT over his/her impending arrival. Apparently, this pregnancy-calendar-landmark is cause for celebration as I’m getting treated to the most active craziness in my belly so far. Good times. Hey, while you’re here – pop on over to our main page and find out what we’ve been up to in the NURSERY! More good times. 2/7/11 – 25 weeks. The funky cravings are starting to hit me. I was wondering when that would happen. This week’s strangest? Oatmeal with feta cheese. I did not indulge in that one – but thought about it for over 24 hours! Gross. The cookies and cream ice cream craving was much more palatable. 1/31/11 – 24 weeks. Home Sweet Home! I’m so glad to finally be home and back to a (somewhat) normal schedule. That includes some fun house projects… more about that on the main page later… but, for now, let’s talk about the BUMP! I am spoiled. My Mom and MIL treated me to a maternity clothes shopping spree this weekend! Since then, I completely reorganized my closet and started planning outfits like a giddy sixth grader during back to school week. Yippee! Here’s the first number – with more to come. I think the babe also likes the new rags (must be a girl) – the leaping, cartwheels, and general shenanigans continue with increasing ferocity. LOVE IT. 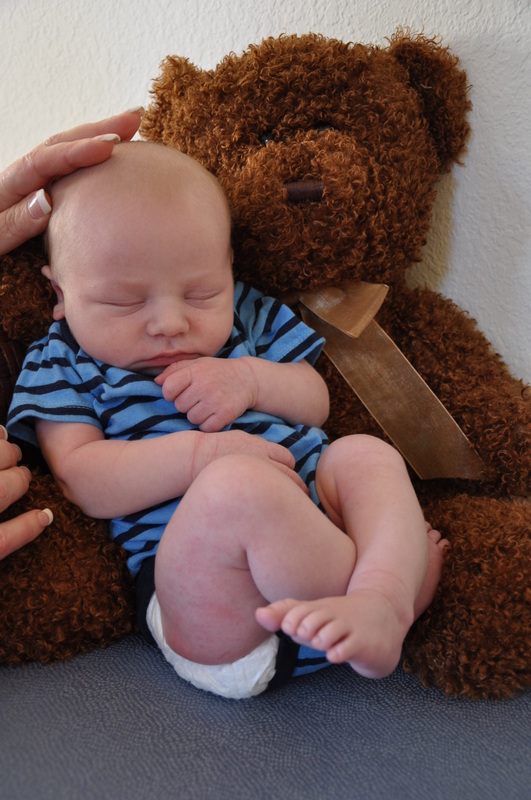 1/17/11 – 22 weeks. The Dreamers are jet setters! Gotta get all this traveling in before the wee-one arrives. (That may also explain the lack of posts on our main page. Sigh.) This weekend, we were in the San Diego, CA area. Mrs. Dreamer actually had a last-minute work trip pop up and the Mr. tagged along (and got in two long bike rides along the Pacific coast – ahhhhh!). The area is also home to many extended family members – including Mrs. Dreamer’s grandfather who joined us for the weekly bump picture below… in front of the Mt. Soledad war memorial in La Jolla. In baby news, this “little one” is getting bigger – and momma feels that more and more every day. Lots of sweet kicks, punches, cartwheels, etc going on in the belly. Enjoying it now – as I know it will get painful at some point! 1/3/11 – 20 weeks: HALFWAY!!! WooHoo… we’re at the mid-way point. 🙂 This week, we’re getting some R&R in Park City, Utah – no skiing for this momma-to-be though. Mr. Dreamer did 21 runs today on perfectly groomed powder. Yes, I’m jealous, but the sacrifice is worth it. Happy New Year! 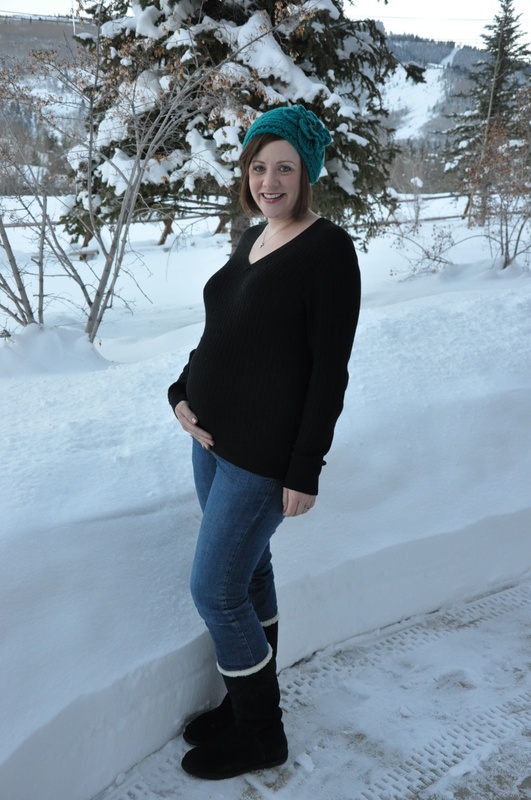 12/20/10 – 18 weeks: What’s better than a baby bump pic? A baby pic! This post is a bit late… but we couldn’t spoil the surprise for the Grandparents (who got new baby pics for Christmas). 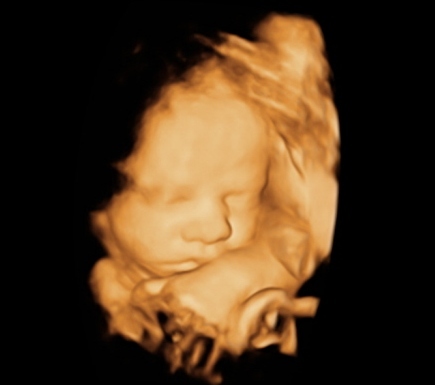 Check out this amazing image of our mini-Dreamer from our 2nd trimester ultrasound. WOW. 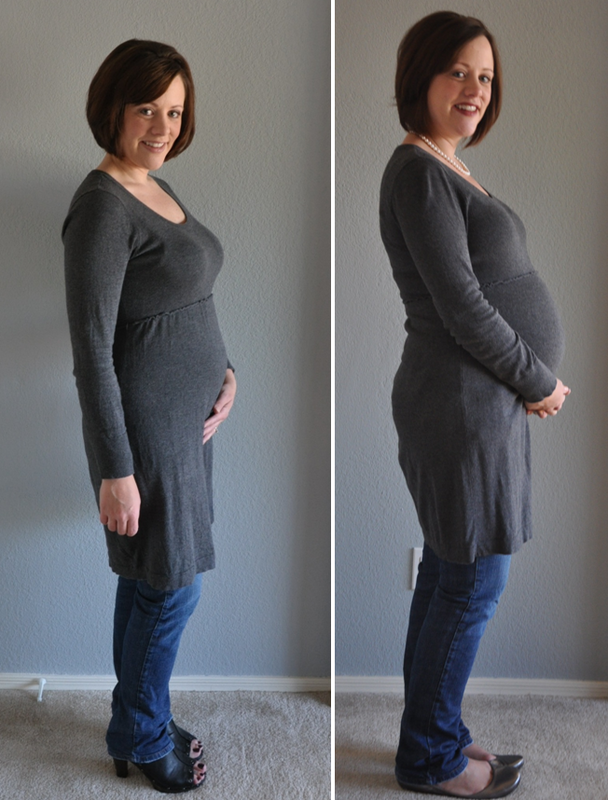 12/13/10 – 17 weeks: Someone told me this week that I “didn’t even look pregnant!” Umm… not a compliment. I’m definitely in the stage where I want to look pregnant, not just like I’ve consumed a few too many Christmas goodies (which I have, but nonetheless…). Anywho, I think this looks like a bump, not a gut – but you be the judge. (Just keep questionable comments to yourself!). 12/6/10 – 16 weeks: MAJOR growth spurt this week, hence the beginning of weekly bump pictures. Before this it was – “Is she pregnant or is she fat?” Now, it’s definitely all beh-beh! (At least, I hope people realize that!) I was upset spending an entire Saturday asleep in bed or on the couch, but was shocked/relieved to see that the bump burst forth that night – meaning baby Dreamer apparently took all of my energy to grow a ton this week. GO BABY!